Now Toast 9 Titanium (releases 9.02, 9.03 and the current 9.04 were used to prepare this review) has added several new functions which keep pace with developments in optical media technology. By and large the product can still be recommended as the market leader in its field. There are other apps – not least Apple’s iDVD – which will allow sophisticated management and burning of CDs and DVDs. But Toast’s multiplicity of features sets it apart. While the jump between Toasts 8 and 9 is not huge, there will be enough new advantages to make the upgrade (rather a pricey one, it has to be said) worthwhile for many users – particularly since many already useful tools within the product have been improved. But it will be necessary for all but the most advanced ‘power’ users carefully to evaluate what’s new and how well it works against how they now use, and might come to use, the product. The danger – which has been skillfully avoided in this version of Toast too – was always that the product would bloat and become too complex to use effectively; there would be too many menus, too many screens, settings and paths through the suite. Far from it: given what it can do, Toast 9 is remarkably simple; spare even. So despite the many things that Toast 9 can do, the interface remains delightfully simple, easy to learn – and to remember. Toast 9’s feature set covers four areas: it has sophisticated CD and DVD (including Blu-ray up to 50 GB) burning routines which cater for data on PC as well as Mac operating systems and can span multiple disks – now without splitting files. You can share your media with other users in a variety of ways. And Toast works well with both audio and video media. It’s in Toast’s video capabilities that version 9 has changed the most: faster preview video quality for certain encoding settings; direct capture and convert from AVCHD high-definition camcorders; better editing for TiVo and EyeTV recordings. You can pause video conversions if needs be – in order to regain Mac process cycles. DVDs can be batch converted and compiled for VIDEO_TS. High-def Blu-ray or HD DVD discs can now be created to play back on the latest set-top boxes as well as on standard DVD media. For video converted for iPod use, DVD chapters can now be preserved – eliminating ‘fast forward’ and ‘rewind’. Toast 9 now supports HD DVDs and can burn up to 30GB of data. 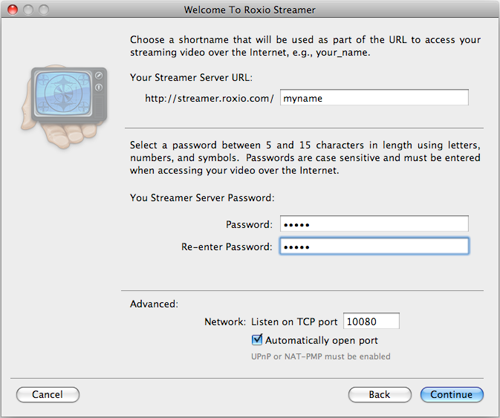 A new bundled application, Roxio Streamer, enables streaming TV and video to your Mac, iPhone or PC via the internet. You also now have integrated access to Aperture and iLife ’08 libraries. For audio, Roxio has devised what it calls a unique audio fingerprinting technology which automatically identifies and tags otherwise ‘anonymous’ (unnamed) tracks so that you don’t have to wonder what could be hiding behind ‘Track_0001’ etc. Toast 9 is now also able simply to capture streaming internet audio – indeed to capture most audio sources. There have been improvements in these four areas of Toast functionality as well: for video the TiVo and EyeTV conversion routines have significantly been improved; as have some of the compression and custom DVD compilation processes. There’s a handful of new menu styles and backgrounds for DVDs, of course. Support has been augmented for such devices as Xbox 360 and BlackBerry. In audio some aspects of audio processing (e.g. crossfades, transitions) have been enhanced; vinyl disc and tape conversion is better and more true to life. Aspects of the user interface have been improved too – especially those guiding the user through choices of media file size and more complex usage. ‘Pause and Resume’ allows video encoding to be temporarily suspended so that CPU cycles can be dedicated to other processes if needs be. Video Quality Previewing lets you see how your converted video will look – before you start encoding it. Both of these functions performed as expected during testing. Lastly, Roxio claims that recovery of files on damaged discs is better (this wasn’t tested as such!). The routines to create high quality photo archive discs with slideshows that will work directly on a PC as well as Mac have been tweaked in Toast 9 Titanium. For those who print their disc labels the process has been streamlined. Not earth-shattering advances, but significant and pleasing to regular users with large libraries. The new Roxio Streamer lets you stream TiVo and EyeTV recordings on your Mac over the internet to a remote device such as an iPod or iPhone. It works simply: from within the application you do no more than name your stream, say “clouds”, which you can then view at: http://streamer.roxio.com/clouds. You can also set a password. Drop the video you want to make available into the window and you’re ready to watch. Streamer also takes care of ports and permissions if you are using an Airport network – and will handle any necessary video format conversion. This, too, works well. 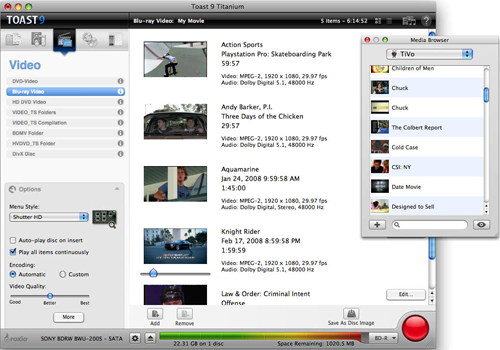 Toast 9 Titanium provides direct access to iMovie 08 projects and Aperture libraries through the regular ‘Media Browser’ menu as part of its main screen. If Aperture (versions 1.5 or 2) is installed, you can browse your projects and import photos stored therein seamlessly. 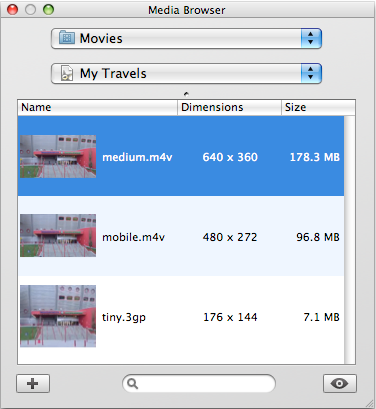 Similarly any project published in iMovie 08 is available internally to Toast 9. Blu-ray is the ‘next generation’ standard for high-definition optical storage. With the same physical dimensions as a standard CD or DVD, it allows much greater capacity at a much higher quality to be stored on the media – typically 50 GB on a dual layer disc, or ten times that of a standard single-layer 4.7 GB one. Toast 9 supports this – with the addition of a plug-in. There’s not much difference in the procedure from burning a standard disc. Although where relevant there will be extra parameters to set. Roxio is aware of the way users actually work with DVDs. Not for everyone is it a technical exercise where math and a stopwatch are fun. Toast 9 Titanium introduces a batch conversion tool which queues up multiple DVD-Video folders for successive burning onto many DVDs. With the option of selecting a balance between quality, compression, speed and what will fit, you then leave Toast to do the work. Toast 9 introduces audio capturing from almost any source – including streamed internet sources. After capture, it’s possible to edit and enhance your source – eventually importing it into iTunes etc. The waveform-based editing is visual, easy to understand and pretty comprehensive. The included, updated, CD Spin Doctor captures and digitizes analogue media such as cassettes and vinyl LPs. With enhanced control over track attributes – not least their names – this application is still best-of-breed for the purpose. Once you’ve used it a few times and been guided through the entire process of importing into iTunes even a few of your old tapes and ‘records’ the price of the Toast 9 Titanium package doesn’t seem so high. As with all the products in this release, the user manual, which is illustrated step by step instructions, assistance with parameters and troubleshooting tips, makes the process if not foolproof, extremely easy and non-intimidating. Toast’s manuals have improved steadily over the years. This one – together with the Roxio forums and speedier technical support from the company – makes use of the suite a smoother experience. In order to author HD DVD and Blu-ray videos you will need a separate plug-in. It’s supplied by Roxio and costs an additional $19.99. 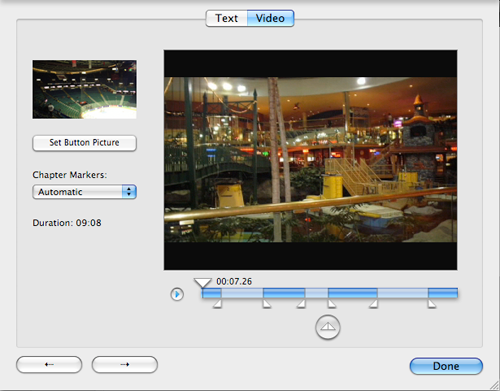 The plug-in also installs 15 high definition menu styles for use with those video authoring projects. Although, not directly tested for this review, there do not seem to be any downsides or usage problems. Toast 9 Titanium is a complex and sophisticated suite of media handling tools that will provide much of what audio and video specialists need when managing and committing their assets to optical media. At the same time, thanks to its simple and uncluttered interface, it continues to appeal to the less demanding user for the power of what it can do to present and preserve less ambitious projects. The learning curve of the software is remarkably shallow; yet the range of tasks it can perform well suited to most users. At times this very smooth consolidation of control into a minimum of screens may mean that it lacks the look-and-feel of software that hasn’t grown as organically as Toast actually has. But it gets the job done, whatever job you ask of it, is now much better supported and – given the multiplicity of tasks it can perform – reasonably priced. Pros: Versatile. Comprehensive functionality. Well-designed. Easy to use yet with good control over (selection of) features. Cons: Has an unMac-like interface feel to it in places. Despite multiple revisions was not 100% stable during some of the tests carried out. But that’s been worked on.